Now that Sachin has, and some may say finally, retired (somewhere Afridi whispers “Never say never…never say never again”), it’s time for a deluge. Of tribute-reminiscences in newspapers, blogs, and websites. Having written a few of these tribute-hybrids, for Sachin (when he retired from one-days) and for Dada (several times) and for Dravid (once), I think it would be better if, instead of writing yet another of these posts, I wrote a little guide-thingey for the mandatory Sachin post, that you know and I know that you know you are going to write, as a full-fledged blogpost or just a lengthy status message or note in Facebook. First of all, let’s start off with the contrarian, critical tribute. Like painting a mustache on the garlanded picture of a recently-deceased or loudly screaming “Shuru karo Antkashari, leke Prabhu ka naam” at someone’s funeral, this is guaranteed to get you attention, some of which might be unwelcome, but hey it’s all in good fun. It’s tough to best the masters like Kesavan and Aakar Patel in this regard, but just because Sachin is a batsman does not mean that Amay Khurasiya can’t be (factoid: he replaced Sachin in 2001 when he got injured). Since Mukul Kesavan has already done the “He didn’t retire early enough” angle, you are advised to take some other route. Like Sachin never having won games for India (an hour at Statsguru and voila this one is done), like being selfish and records-focussed (take the same stats as the previous one, but this time extrapolate to a motive,) or if you want to be truly original, how Sachin’s career reflects the typical Marathi manoos’s journey through life (but write this quickly, because Aakar Patel will beat you to it if he already hasn’t by the time you have finished reading this sentence). Just be mindful of one thing if you want to compare Sachin to some other great (which is almost always the argument—sure he was good but not as good as…). If you are writing anonymous, your choice of reference may give away some of your identity. If you compare him to Dhoni, then you are less then twenty, if you compare him to Ganguly, then you are Bengali, if you compare him to Gavaskar, you have white hair and if you compare him to Vijay Hazare, you are a member of the youth Congress. If you ask me though, I think it’s safer (though perhaps less dramatic) to go the tried-and-tested route of a straight, decent, proper tribute. I was in southern China when I heard Virender Sehwag had been dropped. The news didn’t leave a mark, for cricket is not something much spoken of in the People’s Republic. Then, a week later, on the plane back home, I began listening to Bismillah Khan, and the memories began to crowd my mind. As my playlist went through “Nand Kedar”, “Shyam Kalyan”, “Yaman”, “Durga” and the rest, I thought only of the maverick genius from Najafgarh, of his walk, his demeanour, the coloured cloth tied around his head, and, from time to time, of the range and subtlety of his strokeplay. Every innings of his that I ever saw was replayed in as much detail as the mind of a 55-year-old will allow. That it was Bismillah Khan who set me on to Sehwag may not have been an accident. Bismillah was one of the Fab Five of India’s Great Modern Instrumentalists, in character closer to this particular opening batsman than were the others. Nikhil Banerjee was quiet and understated, Vilayat Khan angular and complicated, Ravi Shankar focused and ambitious, Ali Akbar Khan enigmatic, even inscrutable. Bismillah, like Sehwag, was both joyful and guileless (perhaps the two must go together). As the shehnai played all around me, I went back – as historians are trained to do – to the beginning. Since not of us are celebrities, here is a way you can write a personal story. I was in a rusty bucketheap of an auto, jumping up and down over the potholes of a Calcutta bylane, squeezed between a fat man who was looking me strange and a drunk lightly passed out, his head rolled over to the side, when I heard the news that Sachin had scored a century at Sydney. The autowallah was playing Altaf Raja’s, “Tum To Thehere Pardesi”, and the association between Sachin scoring a century in foreign lands and the song was immediate. That it was Altaf Raja on the broken cassette player, and not for instance Guddu Rangeela or Radheshyam Rasia, was not mere happenstance. Rangeela was voluptuous, Rasia flirtatious, Kumar Sanu vexatious, but Raja, Raja was like Sachin. Clean, crisp and coherent, his voice rang through the bustle of traffic like a Sachin cover-drive through a packed off-side at Leeds. But more than the timbre of the singing, it was the songs, running into twelve or fourteen minutes, that made the connection between him and Sachin the most final, the timelessness of their craft and that neither knew not when to end. As Altaf Raja sang “Woh saal doosra tha, yeh saal doosra hai” in that slight twang of his, I went back- as people trying to get away from the trauma of the surroundings to—to the beginning, to a saal long long time ago. Now that you have a segue into the core of your piece, you have to describe some innings of Sachin that left an indelible impression on your mind. Remember, it must establish both Sachin’s greatness as well as your intimate knowledge of the sport. Because after all, this article is actually about you. Here is my suggestion. Skip the Waqar hitting Sachin’s helmet. Or the sixes off Quadir and Mushtaq. Sharjah. Hero Cup. The Pakistan World Cup game in 2003. Or any of the other “Sachin moments” that have been more flogged than Venkatesh Prasad’s slower balls by Sanath Jayasurya. Pick some random innings of Sachin no one is likely to remember from Cricinfo’s database. Go through the score-board. Craft a story that sounds awesome, as much as for Sachin as for you. Remember the end-game: it should makes readers go “Wow this guy really really loves and appreciates cricket”. An example that is absolutely not true but sounds like it could be, is given below for your benefit. There is an almost Mughal regality about Kotla in March, when the winter that is to pass and the summer that is to come enjoy their last smoldering kiss. I was covering my second game, India versus Zimbabwe. Time flowed slowly like honey and so did the afternoon’s cricket. Vinod Kambli was then the flavor of the season, the proverbial man-ascending-the-stairs-two-at-a-time while Sachin Tendulkar was the elevator stalled between floors. John Traicos had just bowled a very tight over, and you could see Kambli, then just past his century and brimming with bravado, trying to pierce the off-side field off every ball, his shot-making becoming progressively riskier as the ball inevitably seemed to find Briant or Arnott. It was as if he was trying to impress his long-time-friend Sachin at the other end, (he had come in and scratched around for a very unimpressive twenty or so) and after every shot, they would shake their heads and smile, and Sachin would offer some advice in Marathi, and Kambli would shake it off with a dismissive sway of the glove. The next over was from Ranchod. Ranchod had a lovely loop and he could make it float, like a clogged unit at Sealdah station second-class waiting room. Sachin dead-batted the first three deliveries, Kambli shouted something that seemed to be a friendly taunt, and then for the fourth and fifth deliveries, Sachin mimicked exactly the shot Kambli was trying to play last over. Except he threaded it through the fielders, with absolute economy of movement. The sixth delivery he took a single. Between overs, one could see Kambli gesturing animatedly, and Sachin with his helmet off, smiling his enigmatic smile, simply shaking that curly head from side to side. When Traicos came to bowl, the first, second and third deliveries were again creamed through the off-side to the fence, even though Traicos now had cover in the deep, a sprightly chicken-farmer by the name of Eddo Brandes. The sparse Delhi crowd gave a splattering of applause, Kambli patted his bat appreciatively, Sachin gave his famous shrug, but I, I just knew. That the tide had turned. The elevator had started moving. Now you must move from one Sachin incident to the defining cricketing characteristic of Sachin. This is verily the heart of the piece. Again the punch through the off-side, the paddle to leg, the swivel-shot have been done to death. Which is why you must latch onto something else, something a bit less tangible than a square-cut. Say, confidence. What defined Sachin was his confidence. While one could never accuse him of being arrogant, he was also not one to not know how good he was. If Ganguly was struggling against the swing of Pollock, he would walk down the pitch, smile, and move his gloved hand, as if to say “Main hoon na”. If Dravid was having trouble getting off the strike, there would be that reassuring nod of the head and the patting down of the pitch with his heavy bat. Main hoon na. If no one wanted to bowl the last over in a high-pressure game against South Africa, there he was, reaching for the ball. Main hoon na. Now that the dramatic hook has been established, it’s time for the home stretch, the final sprint, where the cricket becomes a metaphor for something that is deeper and hence more poignant. Main hoon na. That was what Sachin had been. All these years. As long as he was at the crease, there was hope. Always. You knew you had to stick around, even if exams beckoned or the end of the world. You had to. And now, it is almost as if that giant rock is no more. In times of need and of fear, the eyes will wander, out of habit, to the corner of the room, to the empty rocking chair and the slippers neatly kept at the bottom, expecting to see that reassuring smile, that “Main hoon na”. Except there will be no more “main”. Just the whirling sound of the biting wind and the fading rays of the sun that is gone. So come on. Fire up your fingers and write that post. Don’t let this opportunity go. There will never be anyone like this ever again. I was masturbating while watching a Sunny Leone clip when I overheard the news (on TV) about Sachin’s retirement. Now one may think that Sunny and Sachin had nothing in common but think again – Sunny, the little master and Sachin also the little master … and the joy of master-bation … aha … this is the stuff heavenly joys are made of. 3. Both of them speak like no one else in the planet. Great article…..the altaf raja part was hilarious!! Perfect, to-the-point, and all that. This is exactly that has been brewing in my mind for some time now. BTW, I took a new path, assuming everyone knows everything about Him. Last para was the best. How many charities were carried out in Sachin’s name. How many wives were not taken to dinner when sachin was played? Now the poor and womenfolk feel vindicated. ” if you compare him to Vijay Hazare, you are a member of the youth Congress” Amazing stuff!! A really different and enjoyable blog. Absolutely fantastic and hilarious one ! . Haha! The easiest topic to blog on – Sachin Tendulkar! Excellent. The next time I ‘do’ the master, I’ll acknowledge this! I think a lot of people are suffering from “Tendulkar retirement fatigue”, so to say. I certainly am. So many people have written and discussed about Tendulkar’s retirement plans over the last couple of years that it finally became quite tedious waiting for him to make the big announcement. What was worse was the diarrhea of coverage all over the media following that much-delayed announcement. The next couple of days one could not go to any channel without seeing Tendulkar’s smiling mug on it. Sure, he’s been great for the country and for the game, but the endless tributes to the guy has gone beyond overkill, if you ask me. When Kohli, Yusuf Pathan and others lifted Tendulkar on their shoulders and carried him around the field after the WC final 2011, it seemed appropriate and touching. When the MI players did the same a couple of weeks back, it started to feel like a boring retread for a player who has been endlessly felicitated over the last few years, regardless of his performance on the field. I’ve been hearing of the elaborate plans that are being made in Kolkata for Tendulkar’s 199th: artists being asked to make sketches of Sachin that will be put on the tickets, tens of thousands of Tendulkar masks being made available for spectators etc. I can imagine the hushed, obsequious tones in which the commentators will speak of Sachin during the game, the endlessly repeated superlatives, the cliches of how he has carried the expectations of a billion people for decades, and how everyone has to “do it for Sachin”. And, of course, the ads that will flood the television screens throughout the games, all, no doubt, innovatively centered around Sachin. All of this is making me positively scared of watching the test matches. I think of how quietly Dravid and Laxman walked away, and how loudly Sachin is doing the same (either from personal desire or due to market pressures) and it makes me want to participate in this whole tamasha even less. I did feel that moment of sadness when I first heard the news, but it has been speedily swept away by this torrent of Tendulkar-worship. I am sure there is a very cynical component behind all this: the BCCI, the corporate sponsors and the media want to milk the golden cow one last time, no doubt, and the cow has to oblige. Probably Tendulkar wants it this way as well. But I cannot help but wish sometimes that Tendulkar had opted for a quieter farewell. Maybe he could have announced that he was quitting on the third day of a test – say the last test against Australia when we were completing a clean sweep, and allowed the media carnival to last only a couple of days. Or any of the other possible occasions that have presented themselves over the last couple of years. But I guess that’s asking for too much in this day and age, where if something is not endlessly screeched by TV presenters and tweeted and re-tweeted and discussed ad nauseum in the blogsphere, then it is not really all that big a news story after all. I came here to know what the Great Bong had to say on Sachin’s retirement but what I got was a cynical post abt the opinion of others. I am disappointed. Why can I no longer see this post on your blog? 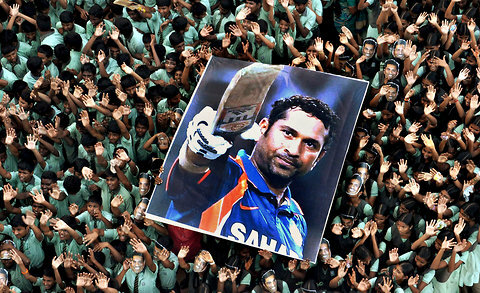 Of course everyone of Sachin’s fans has a personal connection, a favorite nostalgic story. And of course all of these write-ups would appear similar. So what? Greatbong, you too are past your prime apparently. We’ll miss the old blogs which used to actually make us laugh. When I heard the news, I expected this deluge of tributes, re-tributes, and all. I have no right to complain on this. At best, this post was a satirical take on people’s mentality.I sensed an omniscient tone in this article. Not everyone is blessed with literary skills like you, average people express their emotions in average, trivial way. I have seen you do much better GB, not this time. M honered 2 $ay – Sir $achin Ramesh Tendulkar……. I’ll mi$ u a lot $ir….